Wien Walk is one of the most heavily traveled entrance paths into Central Park. at Fifth Avenue and 60th Street. It provides access to the Park for thousands of visitors. 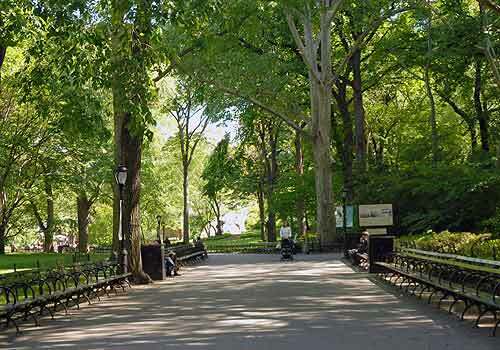 It is named for Lawrence A. Wien, one of the leading New York philanthropists of the 20th century, whose family restored the Walk in his honor. He lived at 785 Fifth Avenue, directly overlooking what is now Wien Walk. Visitors use the benches lining the Walk to eat lunch or just enjoy the setting. Others stop to have their portraits drawn by one of the street artists or to watch the street entertainers. Both sides of the Walk are graced by beautiful perennial and annual plantings, impeccably kept lawns, and a variety of trees. East 60th Street to East 63rd Street near Fifth Avenue.